Today I’m welcoming back one of my favorite people to the WWP blog: Laura Phelps. One of my favorite things about Laura is the way she makes me laugh. She also shares my love for Jesus and women, and I know you’ll enjoy her writing. In addition to raising her four children and loving on her husband, she works for WWP as a phenomenal Regional Area Coordinator. Laura blogs for us once a month, and once a month you’ll hear from me. It took my owning three dogs to reach the conclusion that I am not a “dog person.” I have spent hundreds of dollars just so that I am not that person whose house you visit, and with one step in the door, you are greeted by a barking, jumping, out-of-control dog. And guess what? I am that person. But I am wondering now, after years of chasing unruly canines through the neighborhood, always braless in my pajamas clenching a pound of roast beef in my hand, if perhaps the reason I do not embrace this ownership is not so much because of the dog’s inability to be trained, but my own inability to train it. Truth is, I might have paid for training, but I did not reinforce it. Last week we took the plunge and bought an invisible fence. It might have been the dog’s dangerous sprint across a road and through the neighbor’s yard and down to the lake that encouraged us to finally do so. Also, the foaming at the mouth. Her, not me. But trust me, I was close. I cannot even explain the unspeakable anger that rises up inside of me when she runs away. The frustration that washes over me when I call her name, as she completely ignores me and runs away faster. Her defiance is a combination of total inconvenience, and absolute terror, with a healthy dose of embarrassment, because did I mention? Braless. Pajamas. Roast beef. But if you were to dig beneath the pile of negative emotions that grip me, what you’d find at the bottom of it all is…I am afraid. I am afraid for her safety. I am afraid she will not return home. I am afraid that what looks fun and exciting and completely innocent in the moment is going to ultimately be what kills her. So enter in the Invisible Fence. Because love does this. Love builds hedges and boundaries and will even resort to shocking because life is too precious to risk losing. Love does what love has to do to protect those who do not know any better. And I have got two words for you sweet friends. GAME CHANGER. After just two days of the dog walking into the shock, she understood, ”that space over there? It kinda’ hurts.” And every time she would tap into that zap, she would take fast notice and then I would call her name and she would run back to me. And then, down on her level I would hug her, and praise her and tell her “good girl.” And I will be honest. At first, I worried that she was sad. I feared that she would never sprint and run with that same joy and exhilaration-that euphoria you could see on her furry face when she would escape. I wondered if by giving her such strict boundaries, I was cramping her style, stealing all of the fun out of being a curious dog. Would she be bored outside now that she can’t explore the way she used to? Would she not love me as much because instead of allowing her to do whatever she wants, I have put in restrictions? And I questioned the safety of it all, because what if she broke out of the fence? Would she still come when called? Or would she go back to her old, wandering, undisciplined ways? I realized that these human thoughts of mine were just that. Human. Because we do this, don’t we? We see boundaries as things that keep us from the fun. We see discipline as a punishment. We see fences as things that keep the excitement out. And we want the excitement in. When we have to give things up, things we like to do and hold onto, we tend to only see the loss involved. But as I stand outside now–not only wearing a bra but dressed as well, with no lunch meat in sight–while my leashless dogs plays, I am struck by her freedom. The freedom to run, the freedom to be happy, the freedom to be what God made her to be…without the risk of getting hurt. And quite possibly the greatest beauty born out of this invisible fence is not so much that she no longer runs from me, but that she runs straight to me. Into my arms, head buried into my lap because she knows that with me she is safe. By giving her boundaries, and teaching her where she can and can’t go, I see a trust and compassion that were not there before. This fence has brought us closer together and dare I say, I love her more. Dare I say, she loves me more, too. With Lent just a couple of weeks away, it is good to think about our own invisible fences and where we might need to install them. Where have we been wandering that is not safe? What things do we run to that have the potential to hurt us or others? When God calls our name, do we keep on running away, or do we run back to Him? And I know there are people who just don’t get us crazy Catholics. All of this prayer, and self-sacrifice, and giving alms and good grief, for forty days? I mean honestly, what is the point? So long as we are kind, isn’t that enough? But ya know, I don’t think so. I mean, my dog? She is super kind. Don’t let her Chow tongue fool you. But even the kind are prone to wander. Even the kind fail to respond when they are called. Even the kind need to be reeled in from time to time. My dog is not a sinner. Because well, she is a dog. But I am. And it took a whole lot of wandering and running away from truth to realize that I was a woman who was dying for boundaries; a daughter of Christ that was in desperate need of His protective love. This invisible fence we call Lent is not about what God wants to keep from us. It is not about what we lose, but actually, about all that we gain. 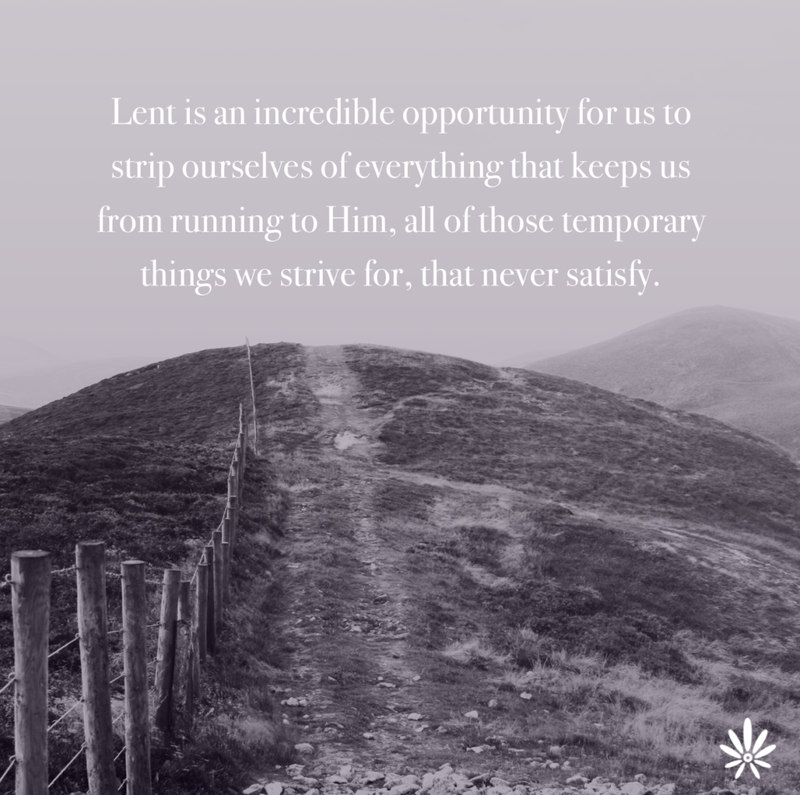 It is an incredible opportunity for us to strip ourselves of everything that keeps us from running to Him, all of those temporary things we strive for, that never satisfy. All of those fun in the moment things we do, only to find that they have left permanent scars that never fully heal. This time of preparation, if we walk through it intentionally, can be the most exciting, most beautiful journey to freedom we will ever know. But we have to allow God to train us. Not because he’s a taskmaster. And not because He wants to control us. He trains us because He loves us. Do you even know how precious you are to Him, or do you doubt if He really loves you? In Lisa Brenninkmeyer’s six-week Bible study, Living In The Father’s Love, she writes, “The more we are rooted in a deep understanding of just how crazy God is about each one of His daughter’s, the better we’ll be able to wrestle with this question.” And maybe you do struggle with this. Maybe you can’t trust the invisible fence works because you are uncertain of the love your Master has for you. If so, I highly encourage you to pick up this short but powerful study, and make it your Lenten promise. See how settling into the truths of the Bible and growing in the knowledge that we are so incredibly loved by our Father, is going to transform your life. Like the invisible fence was to me, I promise this study will be to you too : GAME CHANGER. You see, God just loves you. And He puts all these supports and protections in place so that we stay close to Him. He loves us, and He wants us near. And come Easter morning, He wants nothing more than for us to rise and turn to Him with a whole heart. So let’s use these weeks to prepare wisely. Let’s think about those things that get in the way of Him, and tempt us to wander. And let’s be grateful for the boundaries that help us to know love better; that invisible love that guides us to come to Him when we are called, to run straight into His arms, to bury our heads in His lap knowing this is the place where we are safe, this is the place where we are loved, this is the place where we are truly free.